There’s a new place to play with our DNA results right now. 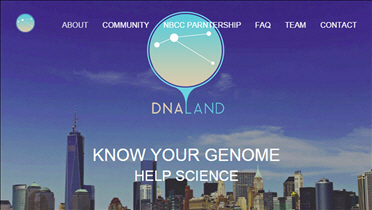 It’s called DNA.Land, it’s at https://dna.land/ — and that’s a complete address, no dot com or dot org involved, and it’s not a testing company but rather a new site where we can upload our DNA results from the testing companies to get more information. The website is strictly in beta right now — which means things will change a lot as more samples are uploaded and more information and tools become available. The one thing that isn’t likely to change even in the slightest: like every other place where we might choose to use the tools to review our DNA results — it has rules. Now there isn’t anything at all wrong with rules. To the contrary, every website that deals with our DNA should have rules. The rules should tell us first and foremost what we have to do when we play in a website’s playground, and they should tell us what we’re giving up in terms of personal privacy as well. So how do the rules of DNA.Land stack up? • By default, we will not share the following with third parties before obtaining your explicit permission: the personal identifiers in your profile, your contact information, your individual-level survey results, or your individual-level genomic data. • If you do decide to connect your social media profiles with DNA.Land, we will never share your genomic data or survey data with any of the social media websites. • To facilitate cutting edge research, by default, we will only share with other researchers or publish aggregated data. For example, we will mix your genomic information with a large number of genomes before sharing and only share the average allele frequencies with other researchers. We will follow the best practices and tools developed according to the “Framework for Responsible Sharing of Genomic and Health-Related Data” of the Global Alliance for Genomics and Health of the National Institutes of Health. Although you’re going to want to click through to the best practices and tools referenced to read for yourself, in general these conform to the essential element of Genetic Genealogy Standards, the new code of ethics for genetic genealogists. How much benefit will we get from this site? We’ll just have to see. But from the standpoint of the rules of the road, there’s no reason not to consider playing in the DNA.Land playground. I tried to sign up there but EVERY username I tried was already taken. Seems impossible to me. You need to use your email address. There’s no such thing there as a username. I was awaiting your legal take on DNA.LAND. I attended a DNA presentation by CeCe yesterday here in San Diego, and she gave it mention. Since it came from her, I took the leap and uploaded all three tests after carefully (not as carefully as you, of course!) reading the rules. Sounded good to me. Thanks again, Judy. I’m still waiting for my own, too! Thanks a lot for taking the time to write a post that covers the consent terms of DNA.Land. There’s a new FAQ on the site that explains there are some browser issues. See if that resolves your issue. I’ve read everything on the site aside from registering, but I don’t see what type of test is covered. Is this for autosomal only? By the way, thanks for the book suggestions. I’m slowly absorbing information. This isn’t a test so much as it’s a different analysis of your existing test results from any of the three testing companies (23andMe, Family Tree DNA and AncestryDNA). And yes, it’s autosomal. So far it’s been taking 4 days and still processing. Anybody else? Mine took 12 days, so — patience. Patience. Remember this is free and it’s beta, so there are a LOT of rough edges. Hopefully it will finish in about the next week or so. The SNPs in each company’s testing aren’t exactly the same so the way they’re going to be read will certainly be different company to company. If you need more explanation, I’d suggest contacting DNA Land.